20,000 miles. 100 courses. 1 epic golf road trip. The Ultimate Golf Road Trip is an epic golf adventure, where we're traveling by RV to play each of Golf Digest's ranked America's 100 Greatest Public Courses. Traversing the country in our Winnebago View, we're discovering America through it's best public golf courses. Beyond golf, we share an inside look at the people, stories, and tales we experience along the way. Follow our route and catch all our latest videos and blog posts below. Buckle up and join us on the journey. It's going to be a wild ride! Wondering what this golf road trip's all about? Click the image to watch and learn the who, what, when, where & why behind the Ultimate Golf Road Trip! Where will the road trip take us, you ask? Explore the interactive map to see our travel route and all the Golf Digest ranked courses we'll play. Explore our latest blog posts and video episodes for all the ins-and-out of living on the road, experiencing some of the best golf in America, and more! Road trips mean lots of driving! Here's a quick look at the milage we've clocked in 2017 traveling full-time in our Winnebago View. Our goal is to play Golf Digest's ranked America's 100 Greatest Public Courses in 2017 - that's 1,800 holes of golf. Will we stop there?! Our goal is to play Golf Digest's America's 100 Greatest Public Courses in 2017, with other courses in between. Here's how many we've crossed off the list so far. The Golf Digest list will land us rounds of golf in 31 states. How many more will we play and explore? We believe that through the great game of golf, we can positively impact and shape the lives of America’s youth. 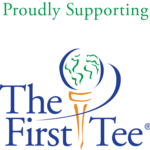 It’s why we support The First Tee, and why we think you should too.